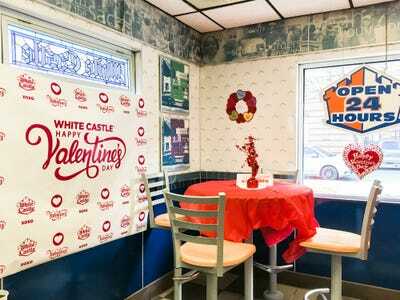 White Castle hosted their 27th annual Valentine’s Day dinner this year at locations across the country. Each store was fully decorated, offering tableside service and a special menu for the holiday. 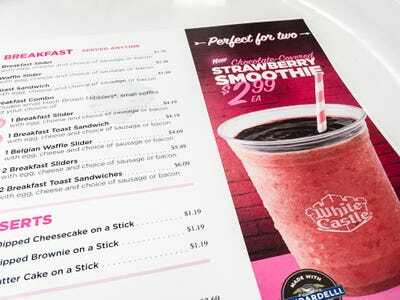 Expected to have a record turnout, the chain allowed customers to make reservations in advance on opentable.com. Most franchises were completely booked up by the time the event started. 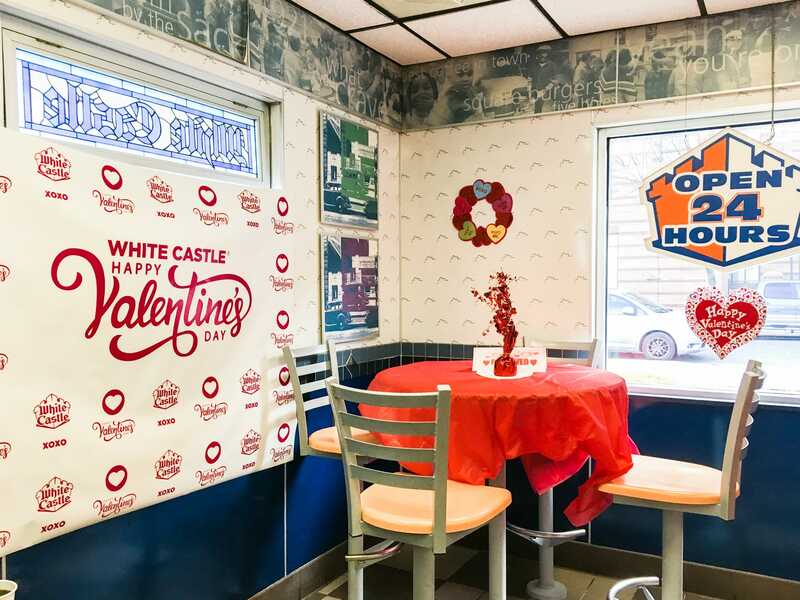 I went to the White Castle Valentine’s Day dinner to see what has made it so popular over the past 27 years. 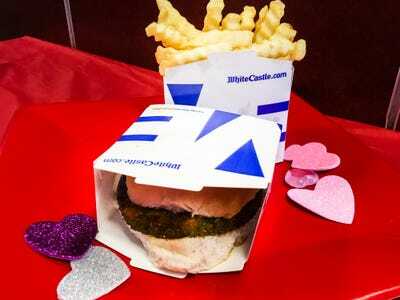 White Castle knows how to do Valentine’s Day. 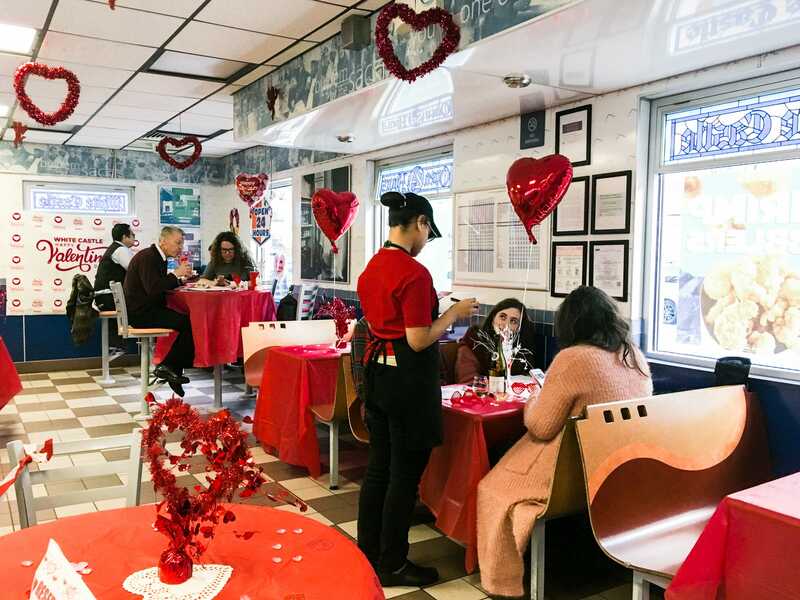 The fast-food franchise changes up its typical setup for this special dinner, offering hostess seating, tableside service, and a special Valentine’s Day menu. When I walked in, the crew was setting up the Valentine’s Day decorations. 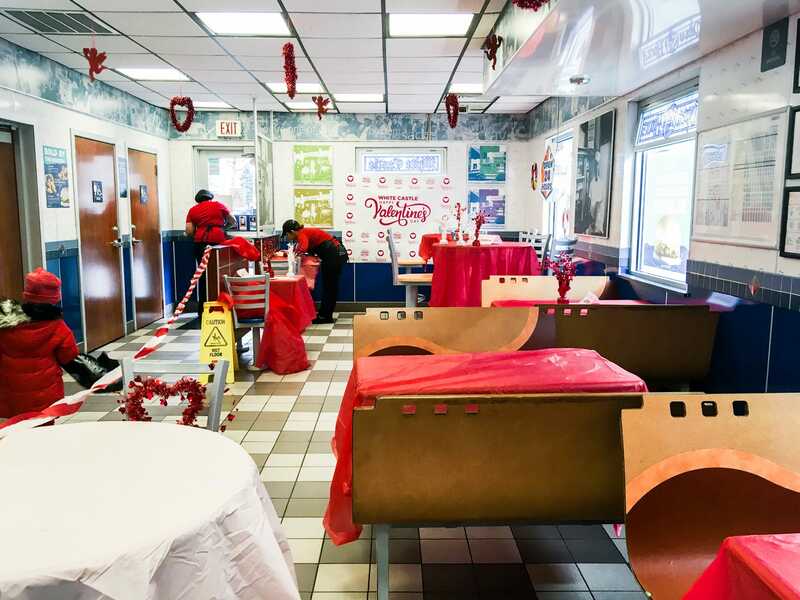 They used red and white streamers to block off the ‘dining room,’ and were putting red tablecloths and centerpieces on each table. 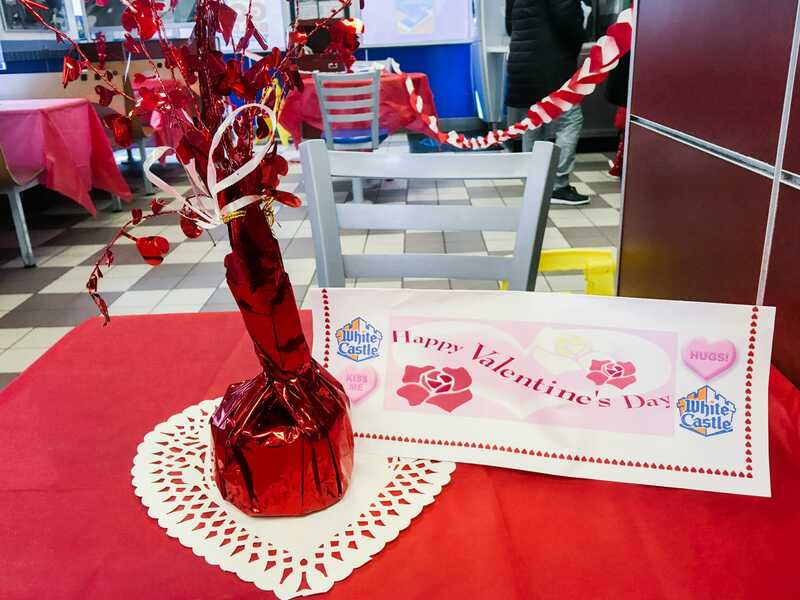 This is what the centerpieces on each table looked like – the manager said that White Castle buys all of the supplies for the night, and the staff decorates. Most people that walked in were totally confused about what was going on – it wasn’t advertised anywhere outside the store that they were having a special event. A few people seemed annoyed that they couldn’t eat there because they hadn’t made reservations. It was mostly families that had made reservations. One family brought a bottle of wine and wine glasses to the dinner, and were offering to everyone there. 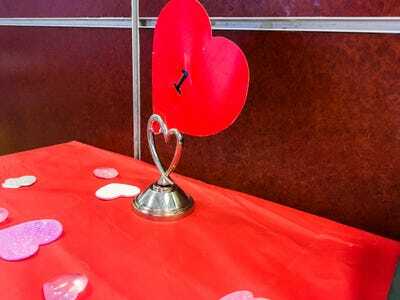 Another couple said that they went to this dinner for the first time 6 years ago, and it had been their Valentine’s Day tradition ever since. The tables each had paper “reserved” signs on them, and I had to wait for a hostess to seat me at my table. Everyone seemed super excited about the dinner, and the staff and customers were all talking and hanging out. The cashiers were waiters for the night, and when I sat down my waitress brought over a little red candle for the table. 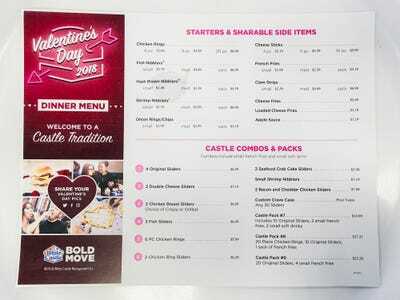 She also brought over a special Valentine’s Day menu on a plastic tray. 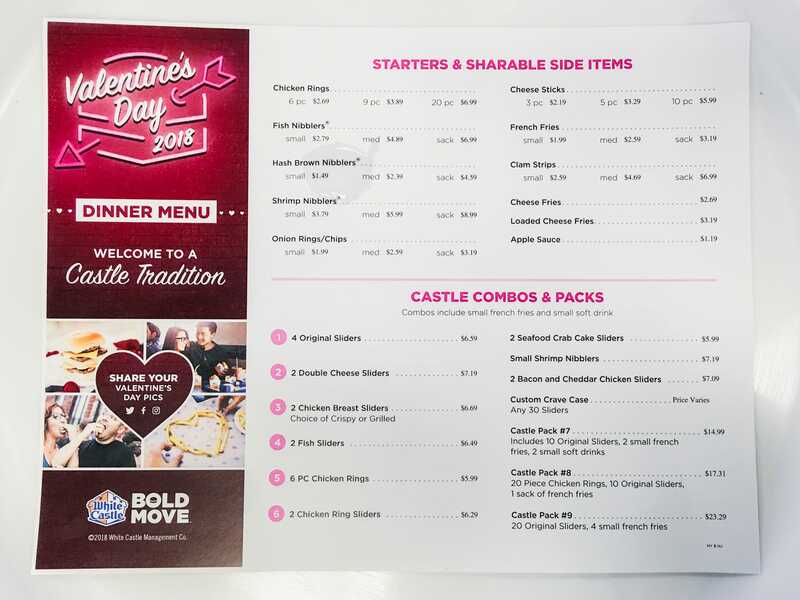 The printed menu mainly listed White Castle’s usual selection, but with a pink and white colour scheme. There were special Valentine’s Day desserts like a chocolate-covered strawberry smoothie made with Ghirardelli chocolate. It also encouraged customers to share their dinner experience on social media. Each table had a little heart shaped card with a table number on it so the waiters could keep track of orders. 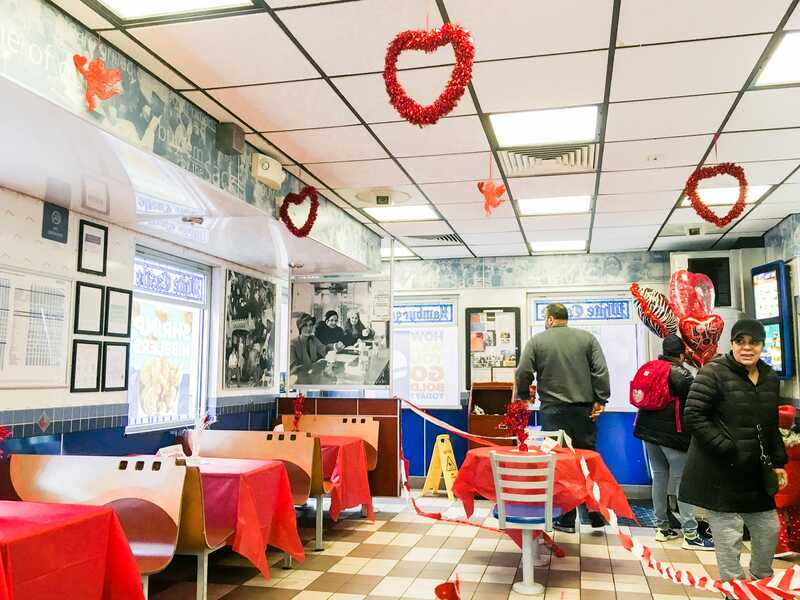 The manager said that the store would fill up soon – they were completely booked with reservations all night. My food was served on a red paper plate with little hearts on it. 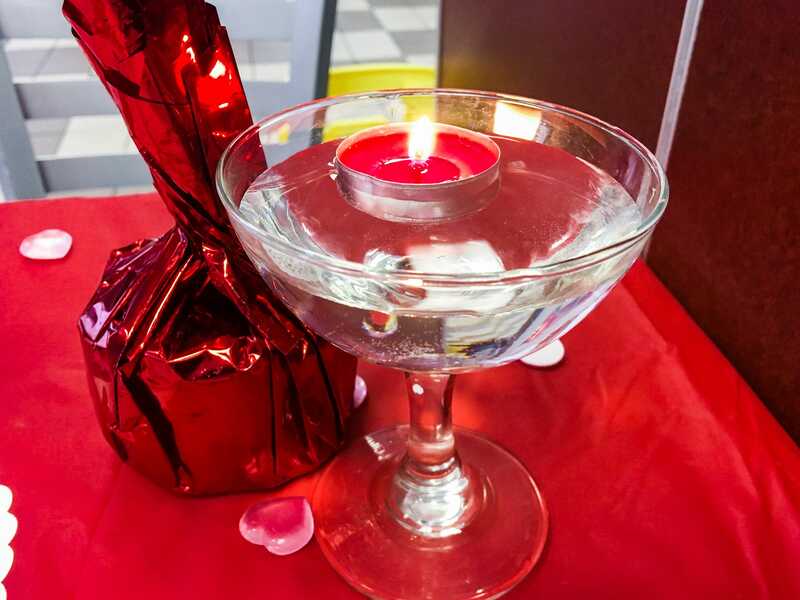 It all felt very kitschy, but it was definitely a fun and low-key Valentine’s Dinner. While it may not be the most romantic destination, it was a a fun and festive way for people to celebrate, and most people at the location I went to had made a tradition of it.